I saw these beads ribbon bookmarks in a big bookstore downtown and decided that I could make them myself and save about US$6.00. These are selling for US$7.90 each in the store. So after deducting the cost of the materials used, I guess I save about $6.00 making them myself. 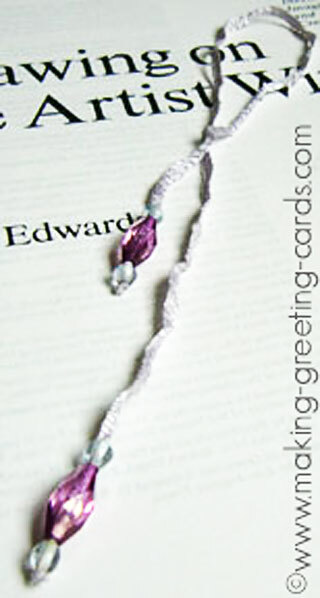 These beaded ribbons are great to insert into books when being given as gifts for birthday or at Christmas. 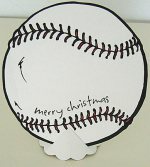 You can also use them as embellishments for your homemade cards. 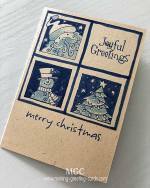 Do let your recipients know that they are not just receiving a card but a bookmark too. I am still a physical book person. I just love holding a paperback on my hands - it's better than a digital book; at least for me personally although I also buy digital books. 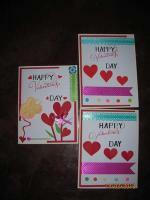 I think because I love paper-crafts and of course paper and card-stocks. On one side of the ribbon, wrap cellophane tape tightly to form a needle so beads could be threaded easily. Tie a knot on the other side of the ribbon. Using the cellophane wrapped side, thread 1 small bead followed by the big bead then the small bead again. Push beads to the end of the ribbon against the knot. Tie a knot to keep the beads on one end. Tie a knot on the cellophane wrapped end about 3" away from end. Thread another small bead followed by big bead and then a small bead again. Remove the cellophane tape and tie a knot at the end to secure the beads. 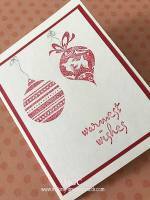 Card Making Tips: You can skip step 5 and 6 if the beads' holes are not too big and the beads do not move loosely on the ribbon. Below is the card I made to go with the bookmark. Here I string the bookmark around the folded card as an embellishment. Do not make a dead knot. And be sure to inform your recipient that it can be used as a bookmark. 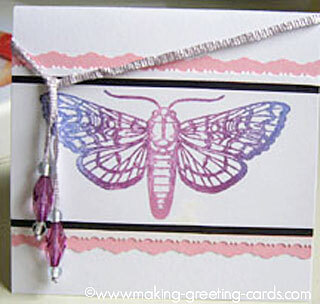 Card Making Tips: Choose very narrow ribbons for this project or use a cord for stringing beads. You can get these supplies from a beads store. Use a tassel at both ends. Make your own paper beads. Use various colour beads and of different sizes.